We’ve fallen in love with the Runaway Bicycle’s dreamy and minimalist collection as we get reminded of what’s in vogue – easy wear that deals in handloom fashion. Browsing through the Runaway Bicycle’s site gave us all the warm and fuzzy feelings. It took us a total of 30 seconds to fall in love with their ‘I’m not sorry I’m late’ collection, only falling in love again with their the piano nights collection. Started out of a tiny studio in Juhu, the label was brought to life to by Preti Verma. The fashion label works only with handloom and hand stitched fashion. Though the apparel looks all sorts of expensive, we found the pricing to be medium and fair. We’re completely gaga over their entire collection. 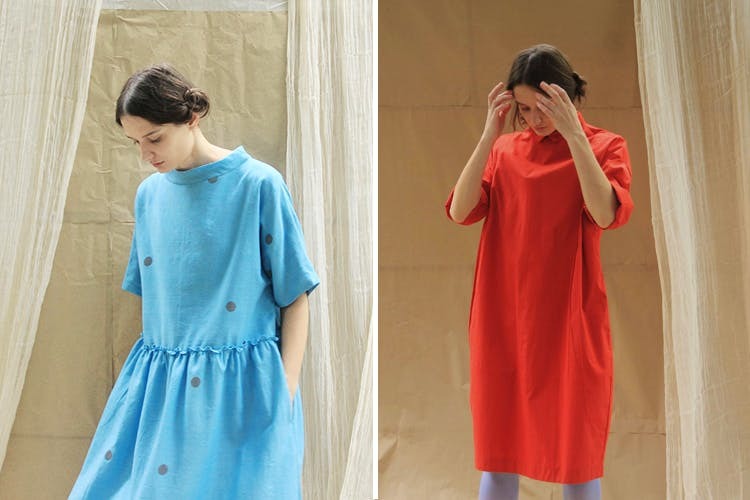 Not only do the clothes come in those dreamy colours of autumnal pastels and colourful palette, we love the unassuming work that has gone in creating them. The clothes scream easy and breathy wear, and we think they’re perfect for anyone who knows what Mumbai weather entails. The extremely versatile collection includes peter-collar shirts, hand-woven cotton dresses starting at INR 3,500. They also do gorgeous cotton scarves, skirts, and shirt dresses. The dresses are perfect for work and going out alike. Runaway Bicycle is for anyone who loves their fashion to be minimal yet out there. Wear these handloom outfits for comfort fashion statements.